main> electric. 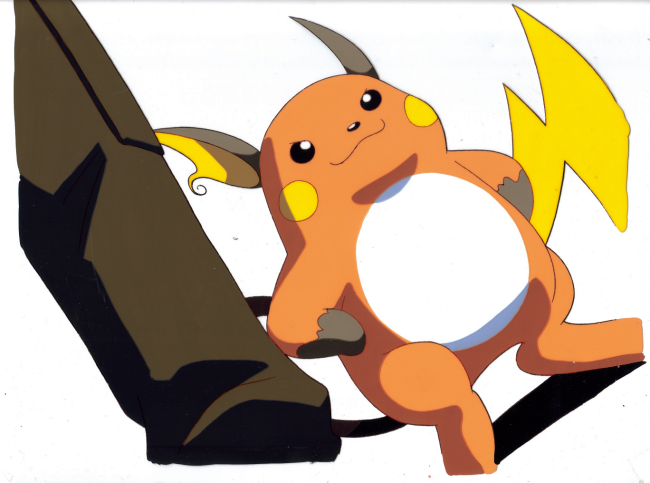 raichu (cels. 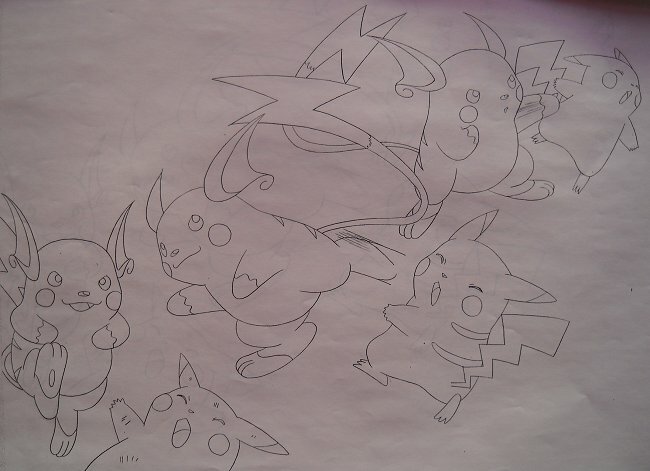 sketches). lizards. lions. more! 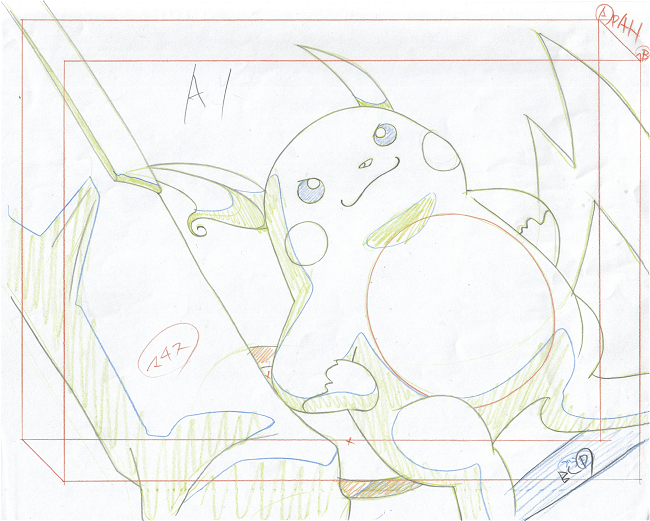 !> production art. wanted. Sunyshore Pokemart! Here is a closer look at my real and beautiful animation cels from Episode 14 (and related media)! These are actual images you see on your screen if you put the episode on right now! 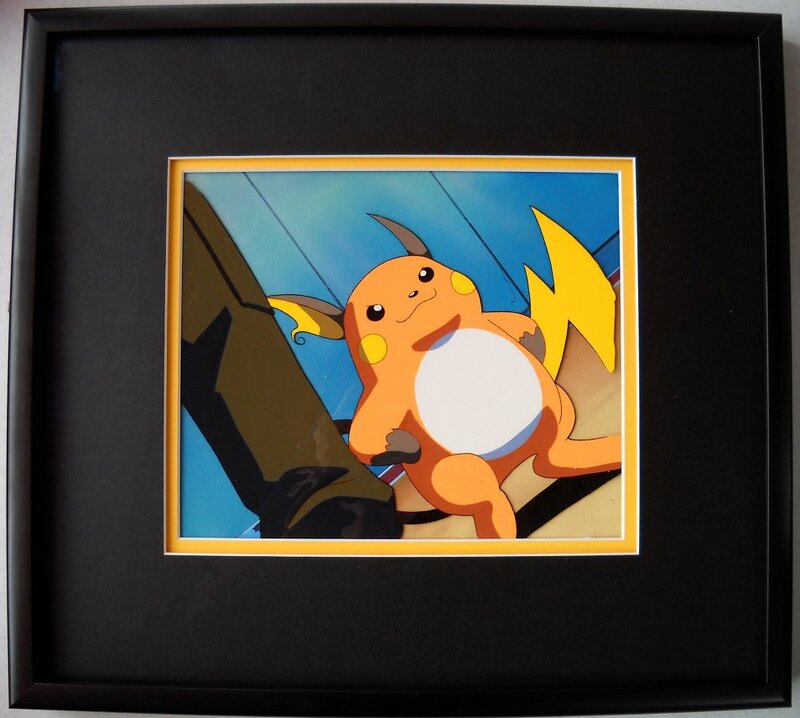 Each is a hand-painted iconic image from this classic episode, featuring Lt. Surge and his powerful Raichu. There is only one of each of these cels in the entire world. 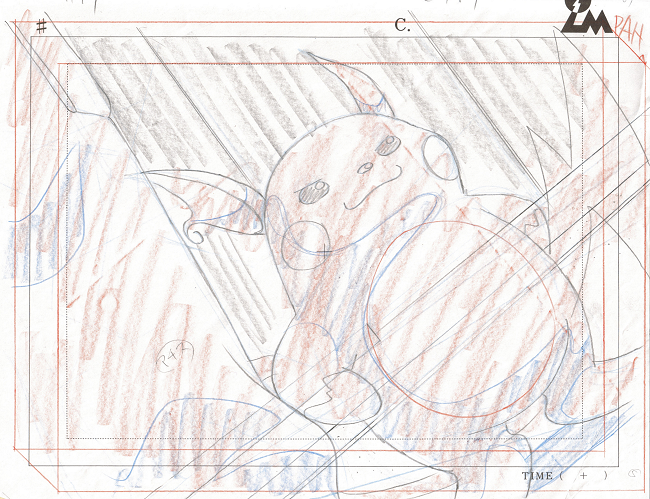 For more art from this classic episode when Raichu first appears: Don't miss my layout sketches and the studio reference settei from this episode as well! 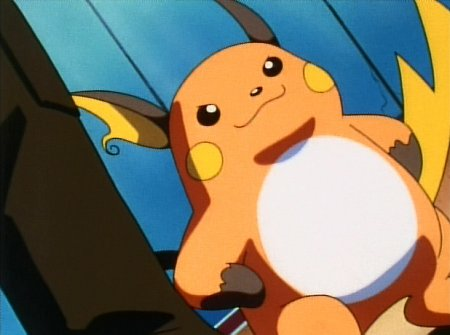 How is a Pokemon episode made? 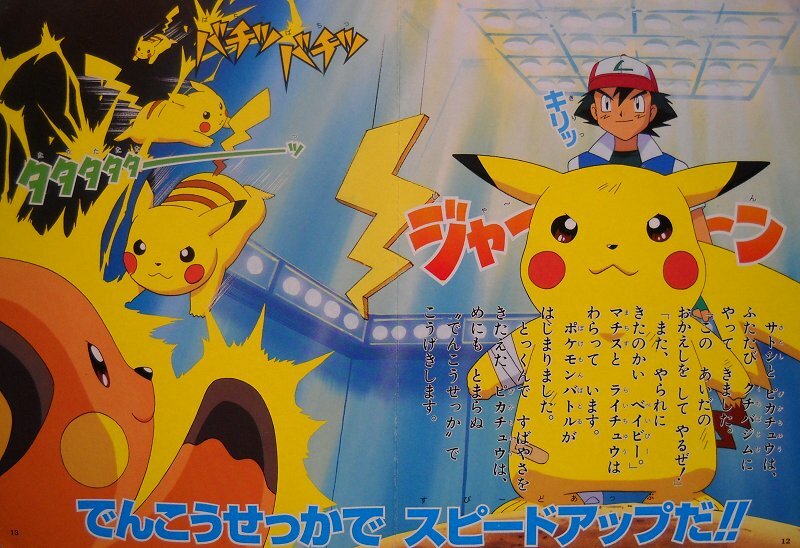 and B3 cel on top, which eerily only contains Surge's head. 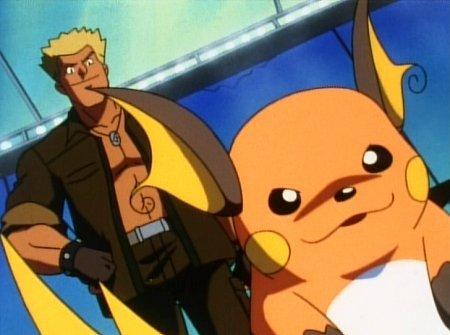 You might wonder, why are Surge's facial lines lighter in the cel? He actually lifts his head and then speaks in this part, and what I own are the three main layers, without the additional layers of his mouth moving, etc. I believe there is a different layer that could go on TOP of this to make him speak, and the main layers are a bit lightened from natural fading over time. and Raichu with Surge's leg, an A1E cel (end cel). 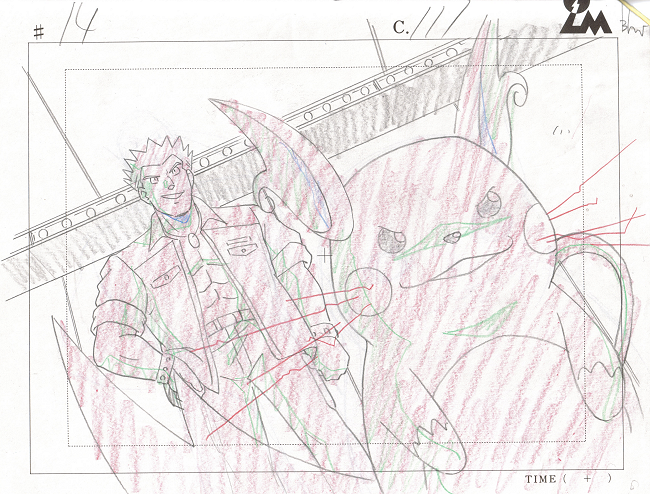 There are no animated movements -- only a camera pan -- in this shot of the anime. Look at how much of the picture is cut off! 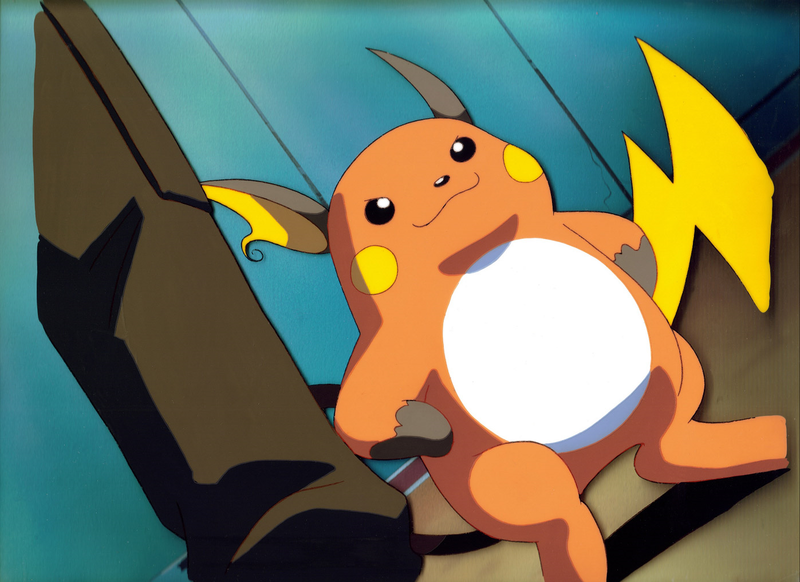 This frame in the anime pans a little bit, so actually more is included, but you still miss out on most of his paws and big tail. Enjoy seeing this process come to life! Working out the positioning of the shot. Still mashing out the storyboard. 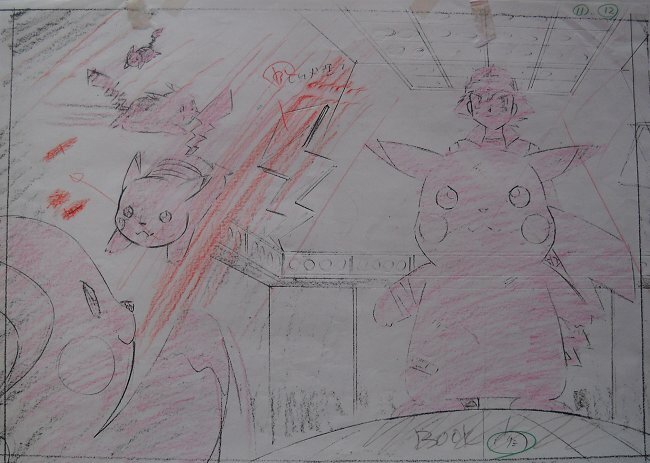 This looks like something I drew when I first saw this episode at age 15! The final storyboard! 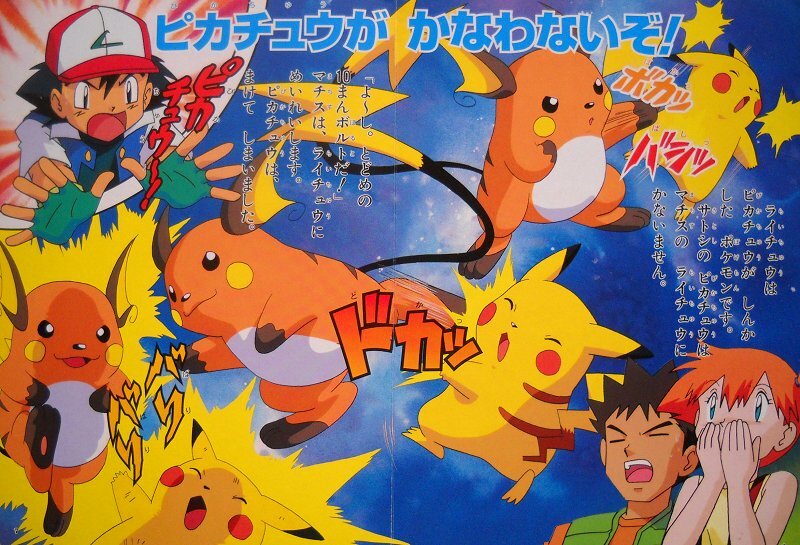 I like how Surge's hand was originally going to be in his pocket. Interesting what small changes are made! 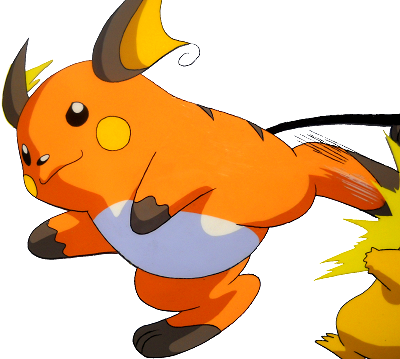 Also, the lightning bolts make Raichu look like a kitty =(^.0.^)= Dat's right. 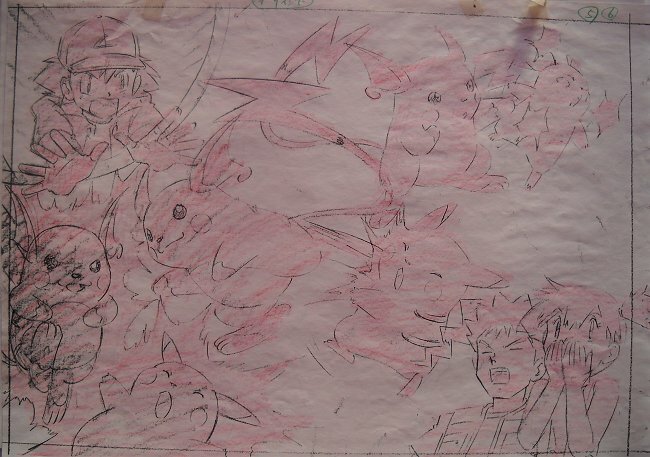 The final cel sketch artwork has a lot of paint on it, as the cel was sitting on top of it for 13 years at this point. 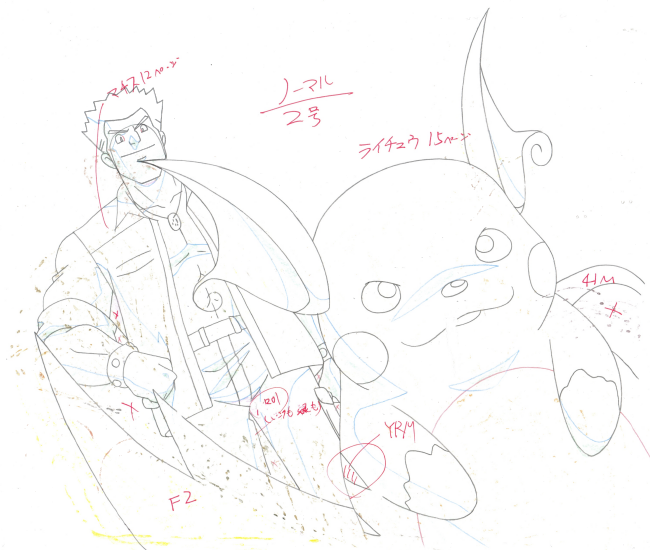 Also interesting - Surge's head is on a seperate sheet of paper, just like how his body is the A1 cel and his head is the B3 cel. I lined them up for you so you didn't have to see just his body with a head-stump - but you can see it here on the sketches even after I put them together! 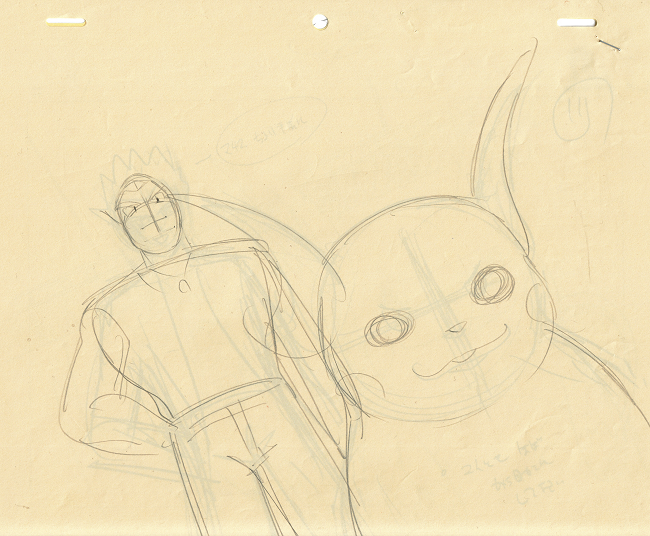 Onto the second cel, no amusing scribbles, but the storyboard was still included! 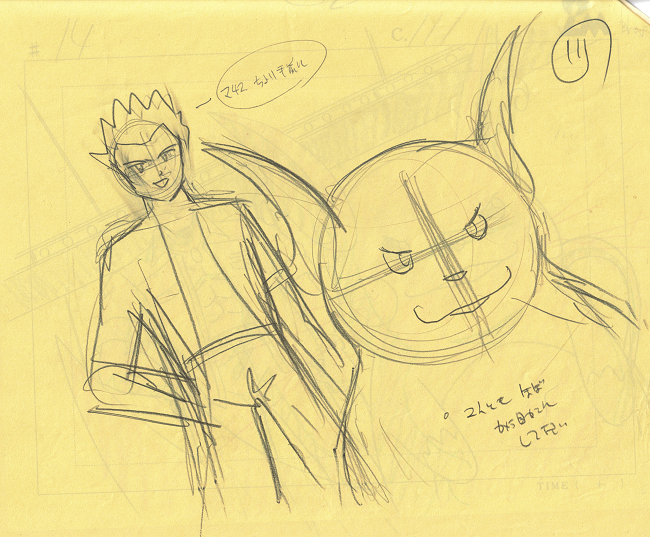 Where's the cel sketch for this one? 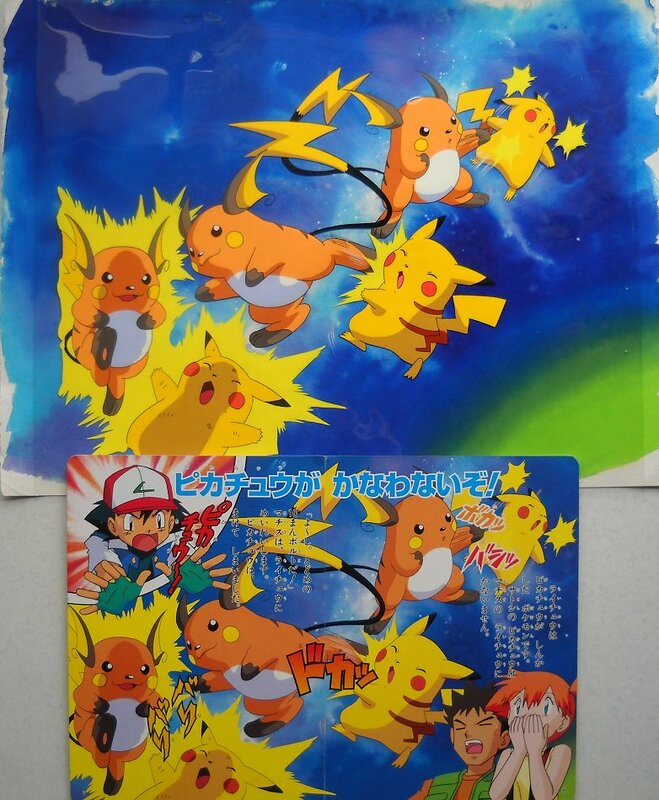 Actually it didn't come with this cel package - BECAUSE I ALREADY OWNED IT! Haha!! 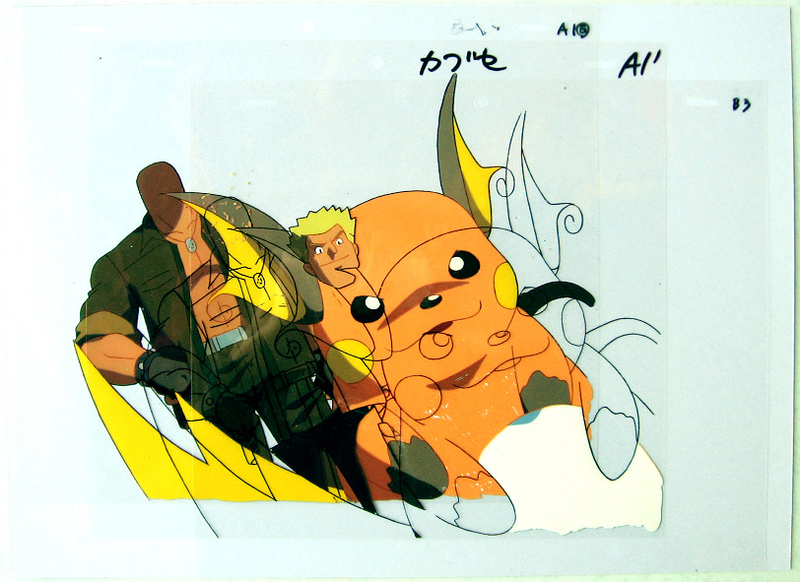 These cels aren't from the anime, right? Correct. But are they from Episode 14? Well, yeah! 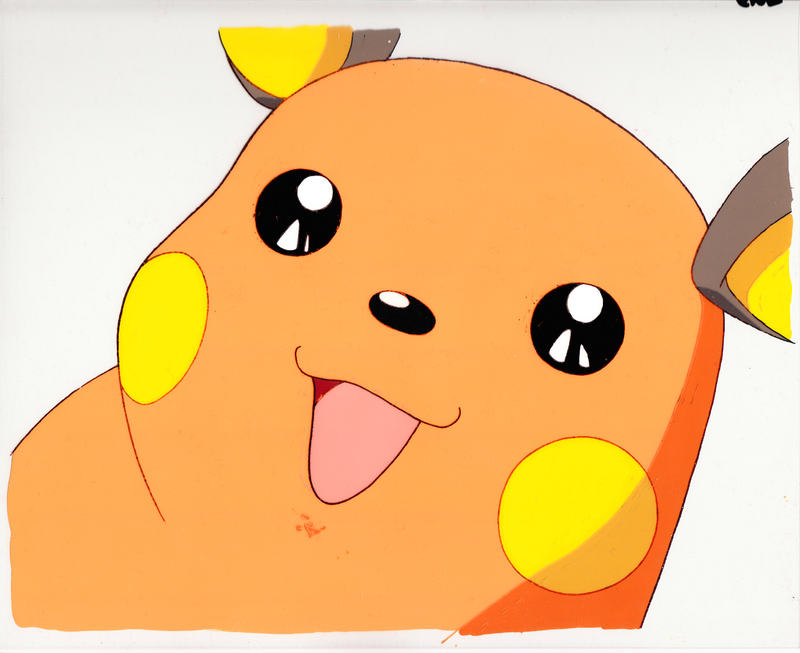 Cels from anime, even Pokemon anime, can be found across the internet. 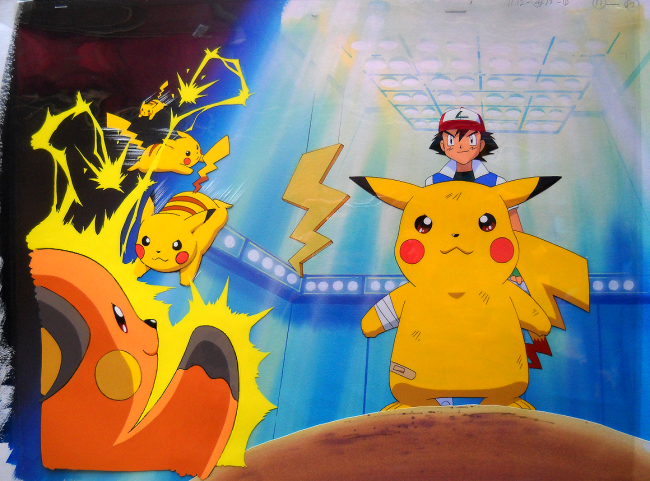 It's difficult to find a Pokemon cel that isn't Pikachu, but they CAN be found. 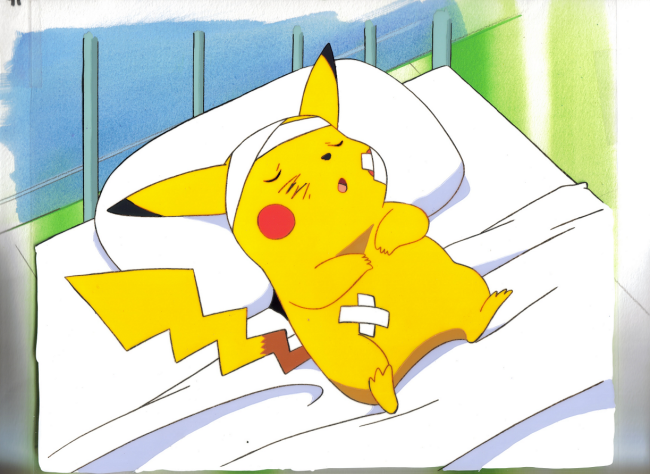 Back in the day, not only was the anime painted by hand, anime storybooks were also illustrated with hand painted cels. 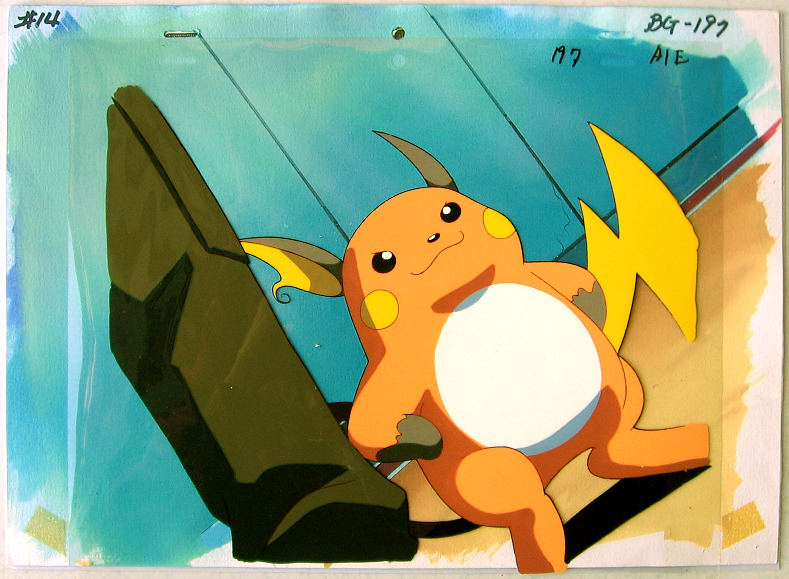 These cels were used in the official Episode 14 storybook, which is all original artwork painted only for that book - no screenshots, no repeats. 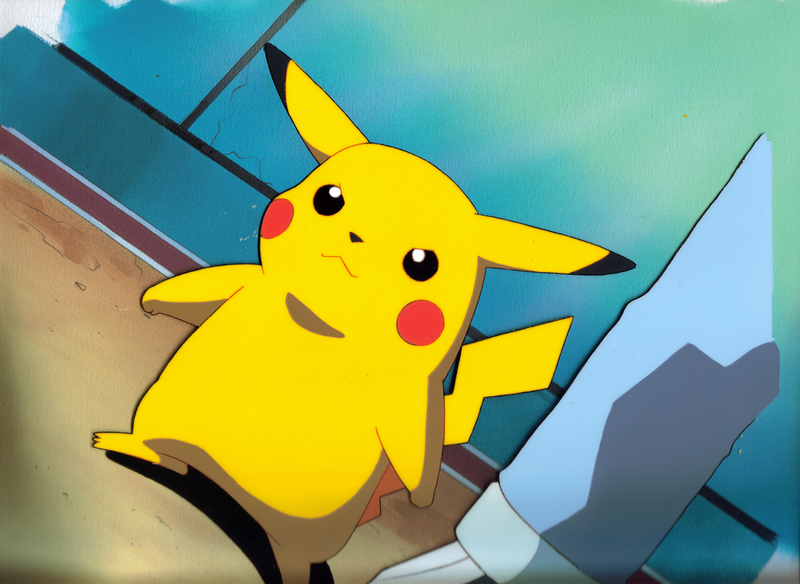 If anime cels are hard to find, this sort of cel is next to impossible. I am so extremely honored to own this beautiful piece and share it with you! These cels are also ridiculously huge, about 50 CM (1.5 feet) long. Check one out next to the book itself! You can now see and read the entire book HERE. 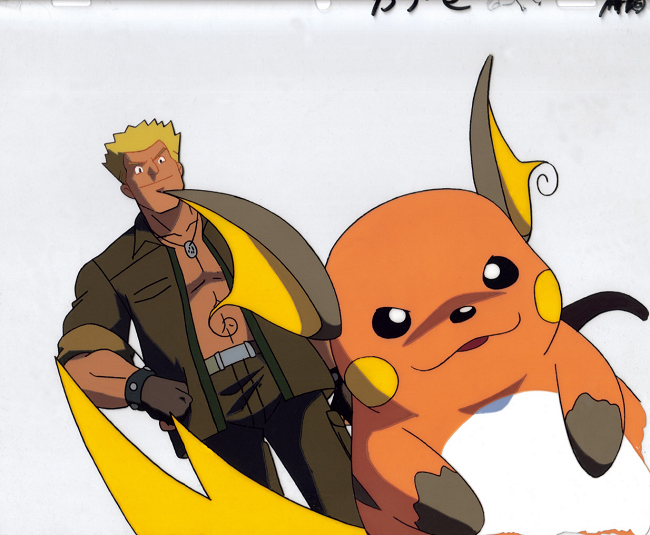 It is completely full of beautiful, original artwork of Lt. Surge and his Raichu! Enjoy! 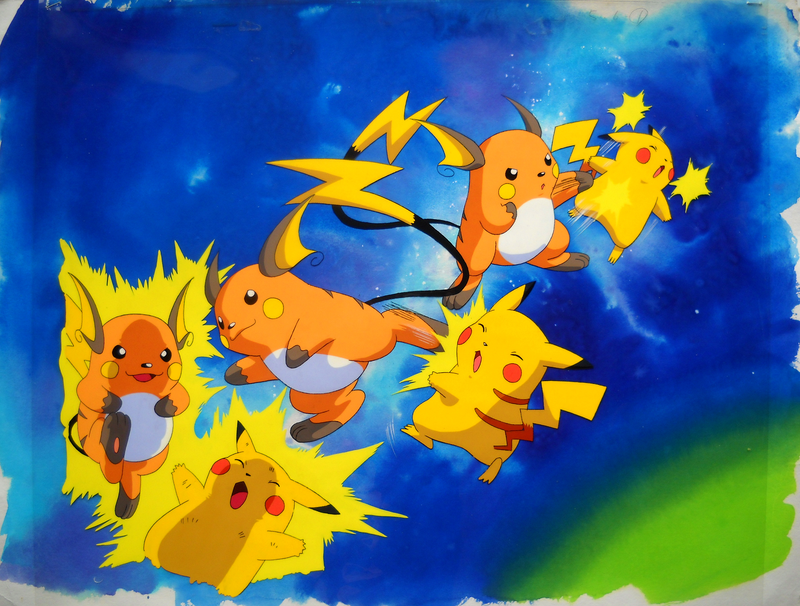 Hey, check out my other cels from Episode 14... recognize one as the twin to one of my Raichus? :) Both with original backgrounds! 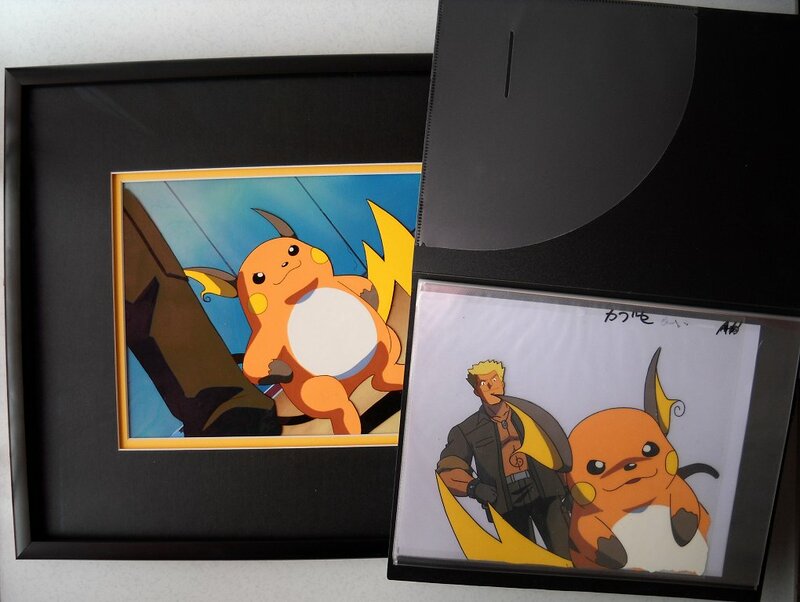 I store each cel very carefully, as one must do as the guardian of these precious treasures in Pokemon anime's history. 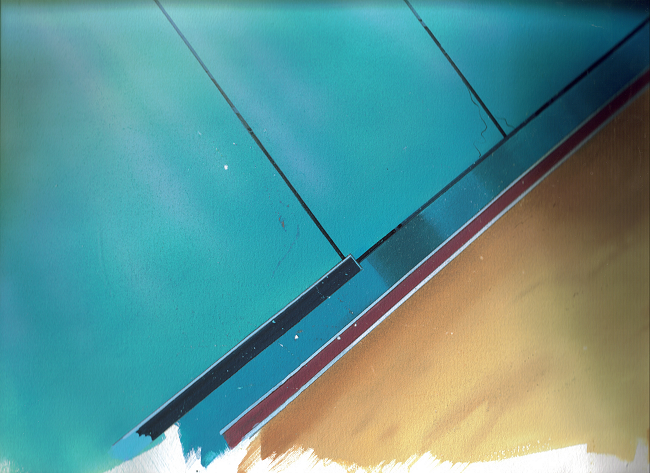 The first one is kept in acid-free archival plastic, each layer in its own sheet to avoid sticking. The second is framed with spacers to avoid sticking, protected by glare-free glass, providing 99.9% protection from UV rays to avoid fading.